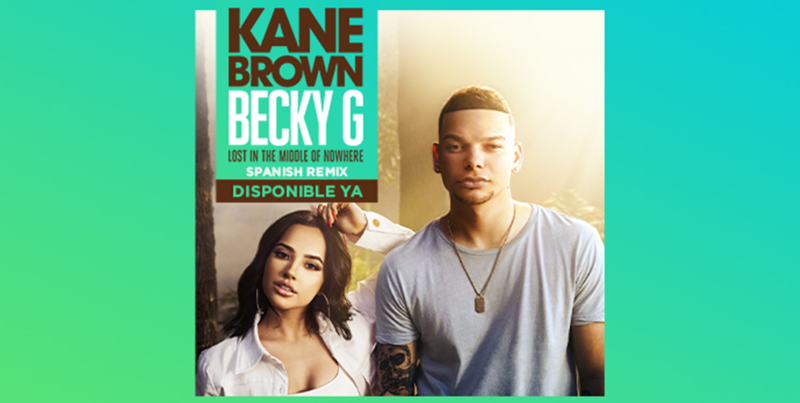 ACM “Single of the Year” Award nominee Kane Brown has released the Spanish Remix of “Lost in the Middle of Nowhere,” featuring singer and actress Becky G.
Additionally, the 25-year-old entertainer announces today the release of a stunning music video of Spanish Remix of “Lost in the Middle of Nowhere.” Brown and Becky G created this concept video combining their two separate worlds, visually fusing multiple fantasy-fueled locations. Directed by Alex Alvga and produced by Ryan Huffman, The Matrix-like beginning of the video transports the audience, Brown, and Becky G into one tropical and one rustic location (dance moves included). Kane Brown and Becky G’s new music clip and track are available HERE. “Lost in the Middle of Nowhere,” which has already garnered over 22 million on-demand streams, reunites Brown with Lauren Alaina, his duet partner on the 4X Platinum smash “What Ifs.” Now as co-writers, Alaina and Brown penned “Lost in the Middle of Nowhere” with Jon Nite (“Break Up in the End,” “Think a Little Less”) and Jesse Frasure (“Life Changes,” “Dirt on My Boots”).